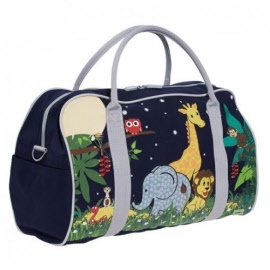 Quality, strong, general purpose kids duffle bag from Bobble Art. Ideal for travel, school sports, etc. Multi-purpose bag that is great for sleepovers, sports carnivals, camping and road trips with the family. The generous interior can be filled with clothes, books, anything you need! Made of high quality canvas this kids bag is built to last. The duffle bag includes a shoulder carry strap that clips into place and can be adjusted. The twin carry handles are woven for extra strength and reinforced to the main compartment of the bag... very kid friendly!